For the analysis of photoelectron spectra of relatively pure iron oxides, one can use peak shape and peak binding energy comparisons to standard compounds to derive oxide composition. McIntyre and Zetaruk’s  paper is widely cited and is still an excellent starting point for qualitative iron oxide determination. Pratt et al. used a series of multiplet peaks to curve fit oxidized iron sulfide (pyrrhotite) surfaces. Grosvenor et al. fitted the various iron oxide, hydroxide and halide peak shapes with a close approximation of the Gupta and Sen multiplet structure. Multiplet FWHM, splittings and weightings are presented. An analysis of satellite to main peak separation is also given. All Fe(II) (high spin only as low spin Fe(II) does not exhibit multiplet splitting) and Fe(III) species can be fitted with Gupta and Sen multiplet structure. Variation in peak spacing and intensity occur for different ligands. Broad satellite peaks of varying intensities at binding energies above the main Fe 2p3/2 structure are present in the spectra for all high spin compounds. However paper  only presents the main multiplet lines, excluding the details needed to fit the broader higher binding energy satellite structures. Table 1  presents full fitting parameters including the multiplet and satellite structure. 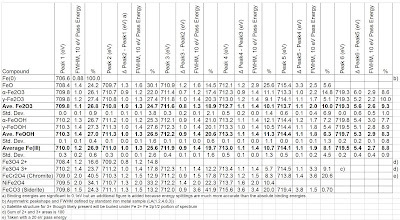 FWHM values are reported for 10 eV pass energy only. To accommodate lower resolution settings slightly broader peaks would be necessary for best fit values. For these fits a Shirley background encompassing only the 2p3/2 portion of the spectrum is used. Also included in this Table are new spectral fitting parameters for FeCr2O4 and NiFe2O4, species that are important for the examination of oxide films on Fe-Cr-Ni alloys, as well as data for new analyses of α-Fe2O3 and γ-Fe2O3. Fitting parameters for FeCO3, which has been noted in certain corrosion products, are also presented in Table 1. These analyses were collected from a mineral sample of siderite (cleaved in vacuum). Carbon 1s binding energy for FeCO3 is at 290.1 eV. 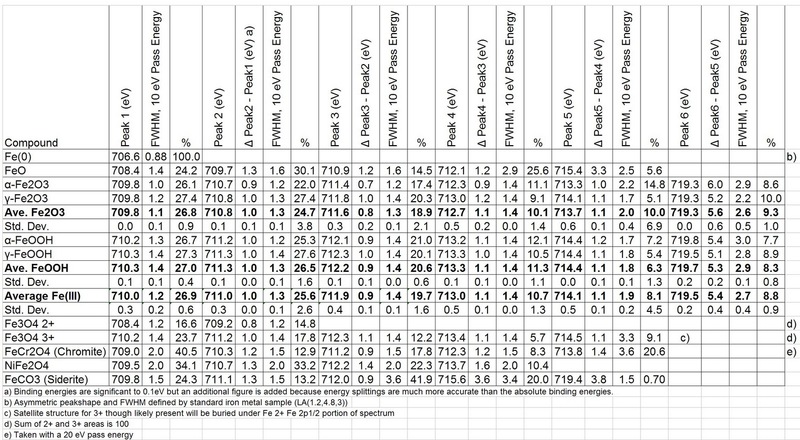 The many spectra are best viewed in the original papers. References  and  are available here. Table 1. Fe 2p3/2 spectral fitting parameters: binding energy (eV), percentage of total area, FWHM value (eV) and spectral component separation (eV) . grazing angle XRD. Some examples of fittings in mixed species samples are presented in . Compared to the other transition metal species, the complex multiple species fitting of Fe is the most problematic. With so many possible species having overlapping binding energies erroneous interpretation can result. A sample with two distinct species can likely be fitted accurately, three species much less so, while four or more species must be looked at as indicative but unreliable. It is worth again stating that corroborating evidence is desirable for this type of Fe surface chemical state speciation. A.R. Pratt, I.J. Muir, H.W. Nesbitt, Geochim. Cosmochim. Acta 58 (1994) 827. R.P. Gupta, S.K. Sen, Phys Rev. B 12 (1975) 15.